If I had to pick a fruit that benefits from home-growing more than any other it would be strawberries. The taste of fresh strawberries heralds the arrival of summer for many people but modern methods of mass-cultivation often leave shop-bought varieties tasting bland or mushy. Contrast this with the soft fragrant strawberries picked from your own garden and the supermarket offerings seem very poor in comparison. For the best tasting perfectly ripe strawberries there is only one option: grow them yourself. Although strawberries can be grown from seed this rarely works well. It is important to start with virus-free plants from a gardening store or nursery because viruses are easily transmitted from infected plants. Strawberries are traditionally planted in autumn so they have time to establish a good root system necessary to yield a crop the following year. Increasingly popular are ‘cold-stored runners’ which can be planted during spring and early summer. These will produce a modest first crop the same year and then a full crop the following year. Soil: Strawberries always benefit from a rich fertile soil with plenty of compost and organic matter dug in. The better the preparation the better the harvest. Competition: Keeping strawberries weed-free is vital and, although the 50cm (20") minimum spacing recommended by our Garden Planner may seem excessive, the resulting crop will be much better for the extra room. Water: Strawberries need a combination of well-drained but moisture-retentive soil. Raised beds with plenty of organic matter such as compost and leaf mold are ideal and it is particularly important to keep plants well watered during the fruiting period. Although gardening stores will often showcase elaborate tiered strawberry pots and hanging baskets these can be difficult to water evenly so be aware that they are often more ornamental than productive. Sunlight: Although originally a woodland plant that will tolerate shade, strawberries give the best crop when given plenty of sunlight. Air Circulation: Strawberries are susceptible to a number of molds, particularly in overcast damp weather, so always ensure good ventilation if grown in a greenhouse or under cloches. Once fruit start to swell it is necessary to lift them from the ground to prevent the berries from getting damp and moldy. Two methods are commonly used here: adding straw to lift them off the ground or growing through black membrane. If using straw, don’t add it too early in the season as it can harbor slugs and insulate the plants from the warmth of the soil causing late frost damage. Black membrane is cleaner and prevents runners rooting but requires careful watering of the plants at their bases (never on the leaves which can encourage virus spread). Most commercial growing is done in plastic-covered beds (which keep the soil warm and the fruit clean) or in raised containers (to keep slugs off). Grow-bags raised off the ground can provide a similar convenience for the gardener but remember that they will need careful watering to keep an even moisture level in the soil. In a greenhouse hot dry conditions can lead to red spider mite problems. Birds: It is almost always necessary to net plants to prevent birds picking them off or you will quickly find partly-ripe fruit lying around the plant with tell-tale peck marks in them as I did earlier this month. Choose netting with 2cm (3/4") holes rather than garden fleece so that beneficial insects can still pollinate the flowers and keep down pests. Slugs: The usual variety of methods including beer traps and picking them off by hand at dusk must be used to prevent slugs beating you to your harvest. Strawberry plants rapidly lose vigor after three years of harvest and need to be replaced. This can either be done using fresh disease-free stock from garden suppliers or by propagating your own plants from the runners each strawberry plant sends out in summer as described in our Strawberry Runners article. However, producing runners does take strength from the plant so make sure that excess runners are removed from the plant so that it can channel most of its energy into producing fruit. Although it is possible to replace all your strawberries every three years a better approach is to replace just one third of them, rotating them to newly enriched and prepared soil as this also reduces the possibility of soil-borne pests building up. I have tried a few varieties over the years and generally prefer the standard summer fruiting types that give good crops of large berries. I always choose taste as the main criteria as some hybrids lack the intense taste of the best strawberries. Alpine strawberries yield smaller, often elongated fruit which have a fine flavor but the trade-off is less harvest. Some alpines don’t produce runners and although I have some in my garden I probably won’t replace them when those ones are spent. Likewise perpetual varieties which fruit through to autumn are good if you have room for them as they extend the season but rarely produce as much harvest. There’s no getting away from it: strawberries don’t keep well. Yes, you can freeze them to use in preserves, desserts or smoothies but this is probably best reserved for blemished fruit or a sudden excess. In my family the strawberries never get that far, rarely even reaching the table as they are so delicious when freshly picked, rinsed and eaten. The seasonality of strawberries may mean that we only get them for a few summer months but the mouth-watering taste is easily worth all the effort! "Is there another way to protect from birds besides the netting? I had a bird die in it when its foot got tangled. Also It's cumbersome to pick the fruit from under it and it's terrible to store and reuse because it gets so tangled up. Thanks, great article, Brenda"
"The traditional way to protect fruit from birds is to put jam-jars over them and I remember doing this as a young child with my parents. However, it's then easy for the fruit to get wet and go mushy, so it should only be used as the fruits start to ripen and the jam jars should always point downwards to allow moisture to drain out." "Wow Jeremy, that's an interesting tradition. I have so, so many strawberries on every plant. There are at least 15-20 per plant and about 14 plants so that method is not practical for me but thanks for the idea." "On a square or rectangular bed, I found bird-netting easier to control if it was draped over hoops, fastened at the top, then the long sides "hemmed" with a stiffener, such as a bamboo pole. When wanting access to your berries (or other crops), you lift the stiffener up and over. Catch-nails on the sides of the raised bed allowed me to "lock down" this quonset-hut netting against raccoons. You do have to permanently close off the ends, though, or the birds will treat your structure like a tunnel and walk right through." "I like this idea. So this is a structure that you can remove in the off season and put back on when you want it, correct? Do you have a picture than you can share?" "Thanks for all the tips. I'm confused you say that alpines don't produce runners...my garden is full of tiny strawberry plants and some strawberries, which produce runners like mad. I was told they were alpine. Are they not? " "Hi Judith, my research and my own experience of one particular alpine variety (Tarpan) is that they don't produce runners but it may be that some varieties do (or perhaps you have a particular crossed variety with some links to alpine types?). I think the term alpine strawberry may be open to different interpretations as it now refers to various cultivated types." "I also have 'alpine' strawberries that send out many runners on each plant. They would cover the whole garden if given the chance. I'm so glad to have the pest tips given here as the slugs and birds don't bother the little wild strawberries but my newly purchased strawberry plants have big beautiful green berries on them at the moment. I'm going to run out and pest proof them this afternoon." "Brenda, I do have photos that I can share, but I don't see how to do that on GrowVeg, wonderful though it is. You can reach me via my gardening blog, "Garden On, Vashon" at http://blogs.vashonbeachcomber.com/gardenon, and I'll be happy to email you photos and info on how I netted my raised beds." "Thank you Karen for showing me your pictures of the strawberry covers and sharing how you built them." 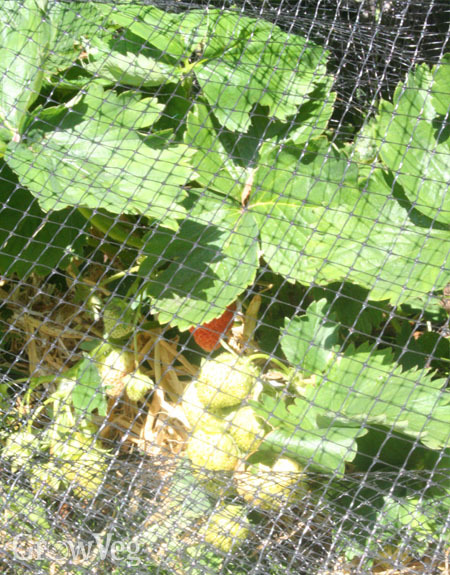 "Chiming in here, I often use wedding net (tulle netting) to keep birds from eating strawberries and black raspberries. The hummingbirds don't get stuck in it the way they do in bird netting. Also, many (but not all) alpines produce runners. Some do, some don't." "I have now corrected the article to say that only some alpines don't produce runners - thanks for your input everyone! I ought to also mention that strawberries are self-fertile and pollen can be transferred by the wind as well as insects, which is why Barbara's suggestion of tulle netting will still result in pollinated flowers." "Just to say the Birds are getting very savvy on my allotment in the South West. They fly into the net and swing until they get the right momentum and hey presto as they swing in they peck the fruit. Clever little things!! Have now made the netting very taut so it doesn't sag or swing." "Hey Fiona, I'm SW area (UK) as well, this must be the same bird, I have my strawberries in a wire cage and the berries that are on the edge, within beak range. I had one poor little strawberry with a half inch groove through it where 'our bird' swung back and forth with precision swinging worthy of the BIG TOP. It made me smile at such determination and made me remember that nature will always prevail"
"if you keep the strawberries in the sun they taste sweeter"
"Do you have specifics on the tulle netting that allows hummingbirds through? I am looking into netting but don't want to exclude or injure them." "Tulle netting is available wherever wedding fabrics are sold. Spread over berries, no birds can get through it, and hummingbirds don't get caught in it. You simply weight the edges with bricks or stones. It comes in many colors -- I think olive green looks most natural." "Having just moved into a new house, I have inherited a greenhouse with a number of strawberry plants growing in raised beds. They are just beginning to flower and I would really appreciate your advice on a number of things, as much of the info out there refers to new plants or plants with a known history; How often should I water them? Should I be removing the early flowers and remove any runners? Is it too late to add compost or fertiliser? Forgive my ignorance as I am a novice to fruit and veg growing, allbeit an enthusiastic novice." "Greg, you're a lucky guy! If your new place has a greenhouse and strawberries, there is probably much more dormant that you have yet to see. Established plants know how to take care of themselves, so relax and spend a year getting to know what you have. Once you've tasted the strawberries and observed the plants' health and bearing habits, you'll be in a better position to know how to intervene." "Slight change of subject. Question to ask. When can I transplant an exisiting strawberry bed to a raised bed area? This fall?" "Yes, late summer to fall is a good time to transplant an existing strawberry bed, although it's also possible in spring. You want to pick a time when they can get a little root growth in to establish themselves for winter but also when the temperatures aren't too hot so the disturbance of moving them won't cause them to dry up. Don't transplant them while they are in flower or bearing fruit." "Dang, better get my transplants out of the greenhouse and into the ground. They are starting to flower." "I have a query about strawberry pests. This year we have masses of fruits developing but when we pick the ripe ones most have one or two holes bored through them. Have searched the internet and think it might be a sap beetle? But can't find anything on what to do about them. Any suggestions? I live in Brittany, France." "i want to move my strawberry bed when is the best time to do thisx"
"I have tons of pill bugs, that get to enjoy my strawberries before I do. They do create a round hole in them"
"I live in San Diego - planted a raised bed (4x6) with a few strawberry plants - some overbearing and some June bearing. They have sent runners to fill the entire bed and produced well - but have been soft and almost mushy from the beginning and don't seem to get any firmer with each new season. They are only firm when they are still pale and not red - by the time they are red and look like ready for picking, they are very soft and near mushy. What do they need? They are in good soil with excellent drainage, full sun, watered daily with small rainbird sprays. I have never fertilized this bed - the plants seemed so healthy and green. I have not had any pest issues other than sharing with the birds (which I don't mind), the leaves and plants and runners are all very green and healthy looking. I weed, prune down and rake out the bed each fall after fruiting. Everything seems perfect except for this very soft fruit. How do I get this fruit to be firm and lasting - at least for a few days after picking? Any advice or suggestions would be most welcome! Thank you! " "Ann, my first thought is to make life a little harder for the plants by lightening up on the water. Maybe watering every other day would help. Otherwise, it could be a variety problem."